Straight Talk USA Full IMEI Check: Carrier Lock, iCloud Lock, Blacklist etc. One of the largest wireless brands in USA is Straight Talk. It is just common to encounter devices which are locked with Straight Talk. Mobile network providers offer payment plans for their locked devices. If someone offers you a secondhand Straight Talk device, a Straight Talk USA Full IMEI Check is a must. Straight Talk USA is one of the multiple brands under Tracfone Wireless, Inc. TracFone Wireless is a subsidiary of Mexico’s largest telecommunications company América Móvil. 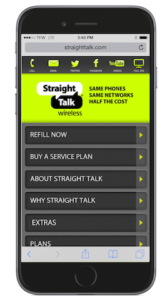 Straight Talk offers a variety of prepaid, no contract phones on their website for use with their plans. Straight Talk also allows customers to bring AT&T, T-Mobile, Sprint, Verizon, or unlocked GSM phones to Straight Talk by buying a SIM card or activation kit and air time from the company. Now, let’s talk about what a Straight Talk USA Full IMEI Check. A Straight Talk USA Full IMEI Check includes a Network Lock check, iCloud lock check, blacklist check, warranty check and in-contract check. If someone offers you a secondhand device, you will be able to know to which network it is locked with or if it is unlocked. It is important to know the carrier in order to use it with the proper network. And if you want to use it with another network, you would be able to know to which network to ask unlock to. The network lock check also includes the country where it is locked. Another inclusion in a Straight Talk USA Full IMEI Check is the iCloud Lock check. This will determine if the device is still locked to the Original Owner’s Apple ID. When a device is iCloud locked, it will not work without the Apple ID and Password activated on it. It is important to know if the device is iCloud locked so you can contact the Original Owner for the Apple ID details. Blacklist check determines if the Straight Talk device is clean or blacklisted. If the device is blacklisted, it will not work inside the country where it was blacklisted. Among the Straight Talk USA Full IMEI Check is the blacklist check. This also includes the country where it was blacklisted as well as the date of blacklisting. Other important features of the Straight Talk USA Full IMEI Check are the warranty check and in-contract check. This determines if the device is still covered by warranty as well as if the device is still in contract with a network provider. Have had their locked device activated on TracFone service for no fewer than 12 months, redeemed air time cards in no fewer than 12 months, and not have had their telephone number recycled or ported. Request this interim unlocking solution while their service is active or within 60 days after their active service days expire. This 60-day grace period applies even if the customer’s telephone number was recycled or ported. Currently own a TracFone branded handset model launched on TracFone’s service after February 11, 2014 or activated with TracFone’s service after February 11, 2015. Must possess a handset that is in working condition. Must possess a handset that is not reported stolen, lost, or associated with fraudulent activity.